The following routes will be adjusted effective Saturday, August 18th, 2018. Where applicable, new schedules for Weekday, Saturday and Sunday/Holiday service have been created to accommodate these changes. Please refer to the new printed service schedules, www.itsmarta.com or the MARTA On The Go app for updated maps and specific trip times. Still have questions? Call us at 404-848-5000, press 131 and speak with one of our Customer Information Operators. Trip time adjustments have been made to improve schedule adherence. The north end of the route has been realigned to serve the south bus loop at Lindbergh Center Station. In addition, select trips will also serve the Woodland Hills routing currently operated by Route 30. The west end of the route has been realigned to serve King Memorial Station. From Cecelia Drive, Route 9 will now turn right on Bouldercrest Road and left on Eastland Road, continuing on Custer Avenue. At Boulevard, the route turns right and makes its way to King Memorial Station via I-20, Hill Street, Memorial Drive and Grant Street. The new Route 9 alignment will operate daily at 30-minute frequency. The route will be called Route 9 – Boulevard / Tilson Road. Inbound trips from Moores Mill Center to Midtown Station have been adjusted to minimize scheduling conflicts at the end-of-line. Trips to Bouldercrest Road and Anvilblock Road have been transferred to Route 32. Instead, alternating trips on Route 15 will operate via Panthersville Road, River Road (toward Cedar Grove High School) and Bouldercrest Road back to Panthersville Road. Routing for the Linecrest Road trips will not be changed. The adjusted Route 15 will operate weekdays at 15-minute frequency during the day and 20-minute frequency on nights and weekends. Trips will continue to alternate between the County Line and new Cedar Grove patterns. The northern terminus of the route has been realigned to Emory University. From Briarcliff Road, service will operate via Clifton Road, Michael Street and Houston Mill Road back to Clifton Road. Stops further north on Briarcliff Road will continue to be served by Route 6. Stops between Lavista Road and Cheshire Bridge Road, including Executive Park will now be served by Route 30. Stops along Lenox Road will be served by Route 27. The new alignment will operate daily at 30-minute frequency. The route will be called Route 816 – North Highland Avenue. The west end of the route has been realigned to serve Five Points Station. From Capitol Avenue, Route 21 will turn left on Martin Luther King Jr. Drive, right on Peachtree Street and left on Alabama Street. From Five Points Station, the route will turn left on Forsyth Street, left on Mitchell Street/Capitol Square, right on Capitol Avenue and left on Memorial Drive. Route 21 will no longer serve King Memorial or Georgia State Stations. Select school day trips to and from Crim High School will continue to be provided. The new Route 21 alignment will operate daily at 30-minute frequency with 20-minute frequency provided during weekday peak hours (approximately 6:00AM-9:00AM & 3:00PM-7:00PM). The southern terminus of the route has been realigned to Brookhaven Station. Service between Brookhaven Station and Lenox Road will now be served by Route 110. Stops on Lenox Road between Peachtree Road and Lenox Station will be discontinued. 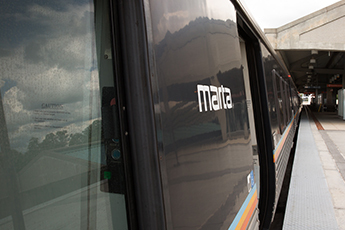 Passengers in this area can access MARTA at Lenox Station, Buckhead Station or bus stops along Peachtree Road. In addition, the select trips to Medical Center Station will now be provided by new Route 825. The new Route 25 alignment will operate daily at 45-minute frequency. The route will be called Route 25 – Peachtree Industrial Boulevard. The northern terminus of the route has been realigned to Lenox Station. From Piedmont Avenue, Route 27 will continue north to Cheshire Bridge Road and Lenox Road. Stops along Monroe Drive will be served by new Route 809. In addition, Route 27’s southern terminus has been changed to Arts Center Station. From Piedmont Avenue, the route will turn right on 14th Street, right on Peachtree Street and left on 15th Street to the station. The new Route 27 alignment will operate daily at 30-minute frequency. The route will be called Route 27 – Cheshire Bridge Road. The northern terminus of the route has been moved to a new location at Ranchwood Drive and Weems Road. From Lavista Road, Route 30 will turn right on Ranchwood Drive and return to Lavista Road via Parklake Drive. In addition, Route 30’s southern terminus has been changed to the north bus loop at Lindbergh Center Station. From Lavista Road, the route will turn right on Briarcliff Road, left on North Druid Hills Road, left on Executive Park Drive, right on Executive Park South and continue on Chantilly Drive. At Cheshire Bridge Road, Route 30 will continue to Lindbergh Center Station via Lenox Road, Buford Highway and Sidney Marcus Boulevard. Stops along Lavista Road (west of Briarcliff Road) and Lindbergh Drive will continue to be served by Route 6. Select trips on Route 6 will also maintain service through Woodland Hills. The new Route 30 alignment will operate daily at 60-minute frequency with 40-minute frequency provided during weekday peak hours (approximately 6:00AM-9:00AM & 3:00PM-7:00PM). The northern terminus of the route has been realigned to the south bus loop at Inman Park-Reynoldstown Station. From Bouldercrest Road, Route 32 will continue north on Bouldercrest Road and Flat Shoals Avenue. At Glenwood Avenue, the route will continue to the station via Moreland Avenue and Seaboard Avenue. Stops along Eastland Road and Custer Avenue will be served by Route 9. Stops along Moreland Avenue, Confederate Avenue, Atlanta Avenue, Cherokee Avenue and Georgia Avenue will be served by new Route 832. In addition, Route 32’s southern terminus has been changed to SouthPark industrial park. From Bouldercrest Road, the route will continue south to Anvilblock Road and South Park Boulevard. The new Route 32 alignment will operate daily at 40-minute frequency with 30-minute frequency provided during weekday peak hours (approximately 6:00AM-9:00AM & 3:00PM-7:00PM). Route 33 has been revised to operate between Doraville Station and Northlake. The new service will be called Route 133 – Shallowford Road. From Doraville Station, the service will operate via New Peachtree Road, Shallowford Road, Briarcliff Road and Lavista Road to Ranchwood Drive and Weems Road. Stops along Chamblee-Dunwoody Road will continue to be served by Route 47. Stops along Briarcliff Road between North Druid Hills Road and Lavista Road will now be served by Route 30. Stops along Lavista Road and Lindbergh Drive will continue to be served by Route 6. Stops along Briarcliff Road between Shallowford Road and North Druid Hills Road will be discontinued. Instead, passengers in this area can access MARTA at bus stops intersecting at Shallowford Road, Clairmont Road and North Druid Hills Road. The new Route 133 alignment will operate daily at 60-minute frequency with 40-minute frequency provided during weekday peak hours (approximately 6:00AM-9:00AM & 3:00PM-7:00PM). Daily service frequency has been improved to operate every 30 minutes. There is no change in route alignment. The Englewood Avenue service pattern has been adjusted to operate via Boulevard directly to McDonough Boulevard. Stops along Custer Avenue will now be served by Route 9. Stops along Woodland Avenue will be served by new Route 832. Trips to and from Moores Mill Center have been adjusted to minimize scheduling conflicts at the end-of-line. The western terminus of the route has been realigned to the south bus loop at Inman Park-Reynoldstown Station. From Glenwood Avenue, Route 74 will continue to the station via Moreland Avenue and Seaboard Avenue. Stops along Glenwood Avenue and Bill Kennedy Way will now be served by Route 107. In addition, stops along Clifton Church Road, Aurie Drive, Verna Drive, Hermosa Drive, and Alameda Trail have been discontinued. Passengers in this area can access MARTA at bus stops along Flat Shoals Road and Clifton Springs Road. The new Route 74 alignment will operate daily at 40-minute frequency with 30-minute frequency provided during weekday peak hours (approximately 6:00AM-9:00AM & 3:00PM-7:00PM). The service alignment has been modified to continue east on North Avenue to serve Glen Iris Drive. At Ralph McGill Boulevard, the route will continue to Parkway Drive and Jackson Street to King Memorial Station. From King Memorial Station, service will circulate to Grady Hospital and Georgia State University via Hilliard Street, Auburn Pointe Drive, Bell Street, Coca Cola Place, Jesse Hill Jr. Drive, Martin Luther King Jr. Drive and Piedmont Avenue back to Coca Cola Place. At King Memorial Station, northbound trips (to North Avenue Station) will board at the bus bay on Decatur Street. The new service will be called Route 899 – Old Fourth Ward. The new Route 899 will operate daily at 30-minute frequency. Trip time adjustments have been made to improve schedule adherence. Route 104 will now operate daily at 45-minute frequency. The west end of the route has been realigned to serve Grady Hospital and Georgia State Station. From Glenwood Avenue, Route 107 will continue west to Bill Kennedy Way and north to Memorial Drive. From here, the route continues to Georgia State Station via Memorial Drive, Capitol Avenue, Piedmont Avenue, Coca Cola Place and Jesse Hill Jr. Drive. From Georgia State Station, the route will return eastbound via Jesse Hill Jr. Drive, Martin Luther King Jr. Drive, Hill Street, Memorial Drive, Bill Kennedy Way and Glenwood Avenue. The new Route 107 alignment will operate daily at 30-minute frequency with 20-minute frequency provided during weekday peak hours (approximately 6:00AM-9:00AM & 3:00PM-7:00PM). Route 109 has been revised to operate between King Memorial Station and Lindbergh Center Station. The new service will be called Route 809 – Monroe Drive / Boulevard. From King Memorial Station, Route 809 will operate via Decatur Street, Boulevard, Monroe Drive, Piedmont Circle, Piedmont Road and Lindbergh Drive to the south bus loop at Lindbergh Center Station. Select trips will also serve the Armour community via Armour Drive, Clayton Road and Ottley Drive back to Armour Drive. Current Route 109 stops along 10th Street, Charles Allen Drive and 8th Street will continue to be served by Route 36. Stops along Auburn Avenue and Edgewood Avenue will continue to be served by Route 3. Service to Grady Hospital and Georgia State University along Piedmont Avenue and Jesse Hill Jr. Drive will now be provided by Routes 107, 813 and 899. The new Route 809 will operate daily at 30-minute frequency. The northern terminus of the route has been realigned to Brookhaven Station. Stops on Lenox Road between Peachtree Road and Lenox Station will be discontinued. Passengers in this area can access MARTA at Lenox Station, Buckhead Station or bus stops along Peachtree Road. Trip time adjustments have been made to improve schedule adherence. Route 124 will continue to operate weekdays at 30-minute frequency. However, service will be adjusted to 45-minute frequency on weekends. Trip time adjustments have been made to improve schedule adherence. Route 142 will now operate weekdays at 60-minute frequency with 40-minute frequency provided during peak hours (approximately 6:00AM-9:00AM & 3:00PM-7:00PM). Trip time adjustments have been made to improve schedule adherence. Route 148 will now operate weekdays at 60-minute frequency during the morning hours (approximately 6:00AM-10:00AM) and 70-minute frequency during the afternoon hours (approximately 3:00PM-7:30PM). Trips to and from Jackson Trace have been adjusted to minimize scheduling conflicts at the end-of-line. Trip time adjustments have been made to improve schedule adherence. Route 180 will continue to operate weekdays at 30-minute frequency during the day. However, service will be adjusted to 45-minute frequency on nights and weekends. Trip time adjustments have been made to improve schedule adherence. Service will operate daily at 60-minute frequency with 45-minute frequency provided during weekday peak hours (approximately 6:00AM-9:00AM & 3:00PM-7:00PM). The eastern terminus of the route has been realigned to Anvilblock Road. Westbound service to College Park Station will now operate via Anvilblock Road and I-675 to Forest Parkway. Stops in SouthPark industrial park will now be served by Route 32. New Community Circulator service has been added to assume the Medical Center pattern currently operated by Route 25. From the west bus loop at Chamblee Station, Route 825 will operate via Peachtree Road, Chamblee-Tucker Road, Peachtree Boulevard, Johnson Ferry Road and Peachtree-Dunwoody Road to Medical Center Station. This new service will operate weekdays only at 60-minute frequency. New Community Circulator service has been added to assume segments currently operated by Route 32. From West End Station, Route 832 will operate via Lee Street, Ralph David Abernathy Boulevard, Georgia Avenue, Cherokee Avenue, Atlanta Avenue, Confederate Avenue, Moreland Avenue, Moreland Drive, Woodland Avenue and Custer Avenue back to Moreland Avenue. This new service will operate daily at 30-minute frequency. The Peyton Forest segment of the route has been adjusted at the request of the neighborhood. Service will no longer operate along H.E. Holmes Drive/Peyton Road between Martin Luther King Jr. Drive and Peyton Place. From H.E. Holmes Station, service will instead operate via Martin Luther King Jr. Drive, Harlan Road, Peyton Road and Peyton Place back to Martin Luther King Jr. Drive. Eastbound trips will then continue to West Lake Station and Dixie Hills (with select trips to Florida Heights). Westbound service will also operate via Martin Luther King Jr. Drive, Harlan Road, Peyton Road and Peyton Place back to Martin Luther King Jr. Drive before returning to H.E. Holmes Station. SPECIAL EVENT DETOURS – During special events at Mercedes-Benz Stadium, Georgia World Congress Center and Philips Arena, select MARTA bus routes may experience delays. To minimize those impacts, Special Event Detours have been added to the printed service schedules for Routes 3, 26, 51 and 94. Buses will follow the Special Event Detours whenever traffic levels or street closures in the area can no longer support dependable operations.